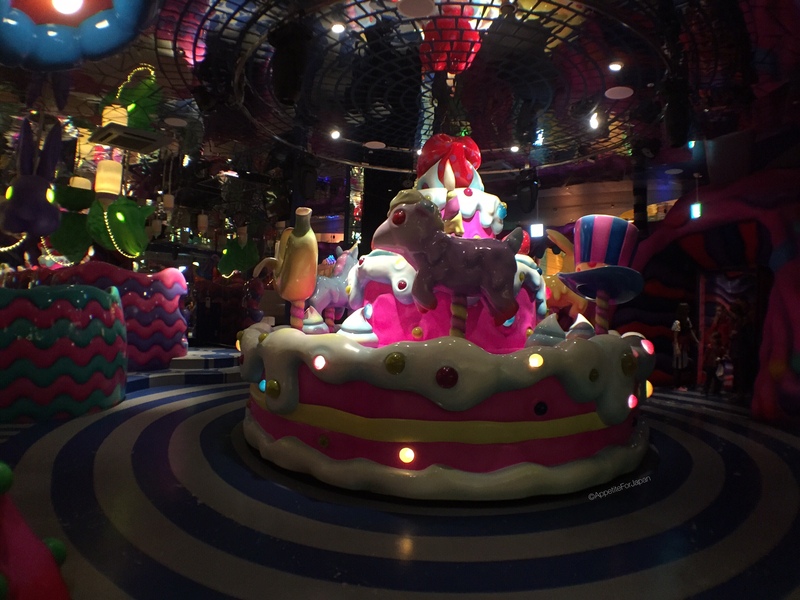 We chose a week day to visit the Kawaii Monster Cafe, knowing that themed eateries are often busy, and visiting such a kooky venue in Harajuku would no doubt mean long queues on the weekend. 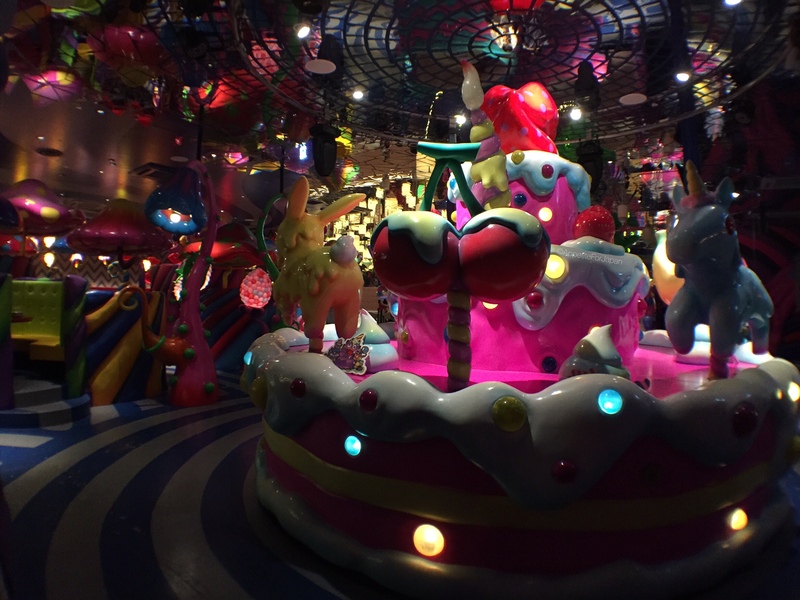 We arrived at 11:40am, hoping that getting there before lunch would also reduce the wait to get in (you can’t make lunch reservations for the Kawaii Monster Cafe – but you can make reservations from 6pm). There was already a queue when we arrived, and we waited about 15 minutes to get in. Strangely enough, once we were seated, we noticed that more than half of the tables were empty. This is something that we’ve also noticed at many of the table service restaurants at Tokyo Disney Resort – they allow customers to queue for lengthy periods, leaving up to half the tables free the whole time. The 15 minute wait was fairly painless, and there are a few things to look at as you get closer to the front of the line. On the left is a monitor in a display shaped like a large egg. 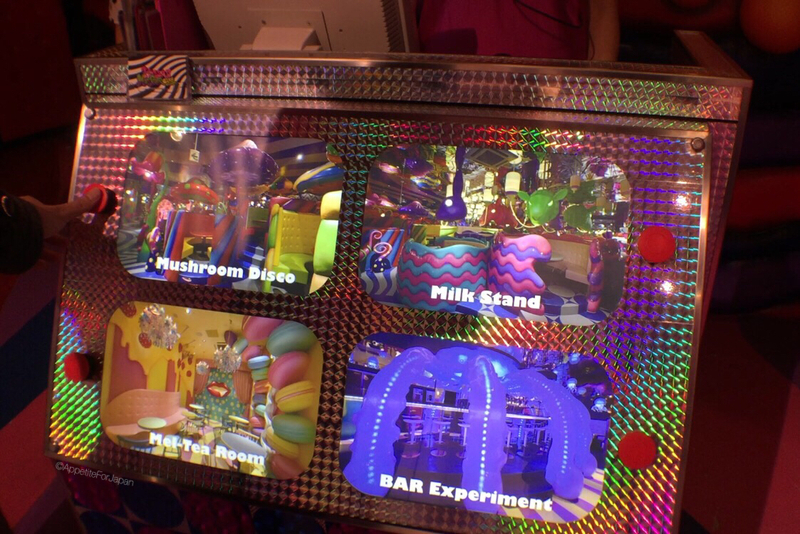 It displays footage of the interior of the restaurant. Behind the front counter, giant monster eyes move around. At the front counter, a display shows the four different sections of the restaurant. You can select the area that you want to dine in by pressing a button on the display. The menu is the same regardless of where you’re seated, but each area has different, spectacular decor. Once you choose the area, the staff member then shows you an iPad with pictures of two further options within the area that you have chosen. You can either sit in a booth (for an additional fee), or you can sit at a smaller table. To the left of the counter is the entrance to the restaurant, which is meant to be the monster’s mouth. 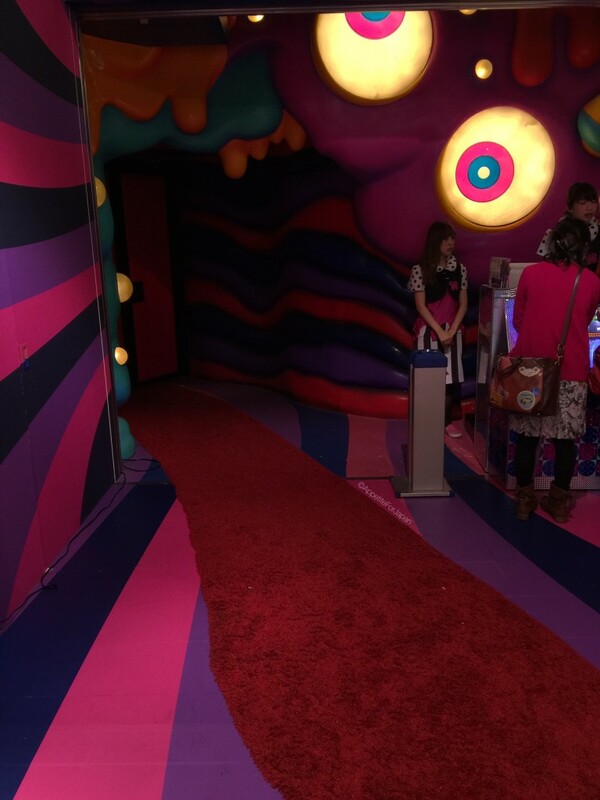 The red carpet leading into the corridor is his tongue. The restaurant’s mascot is Mr. Ten Thousand Chopsticks, or Choppy for short. 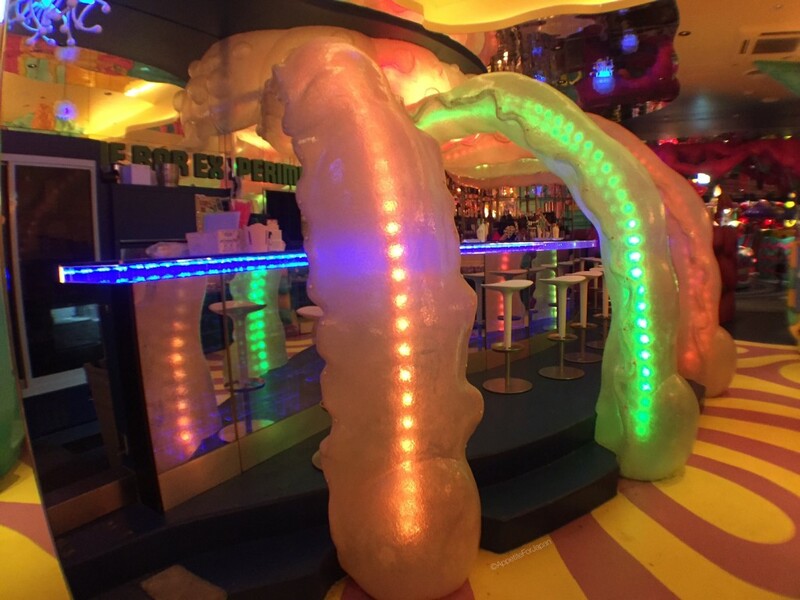 Choppy is meant to represent Harajuku which, according to the restaurant’s website, “is like a monster that swallows everything in its path and keeps expanding”. They’re talking about the creative culture of Harajuku which is known for its over-the-top fashion. The first thing that you’ll see once you enter the restaurant is the big cake-shaped merry-go-round. 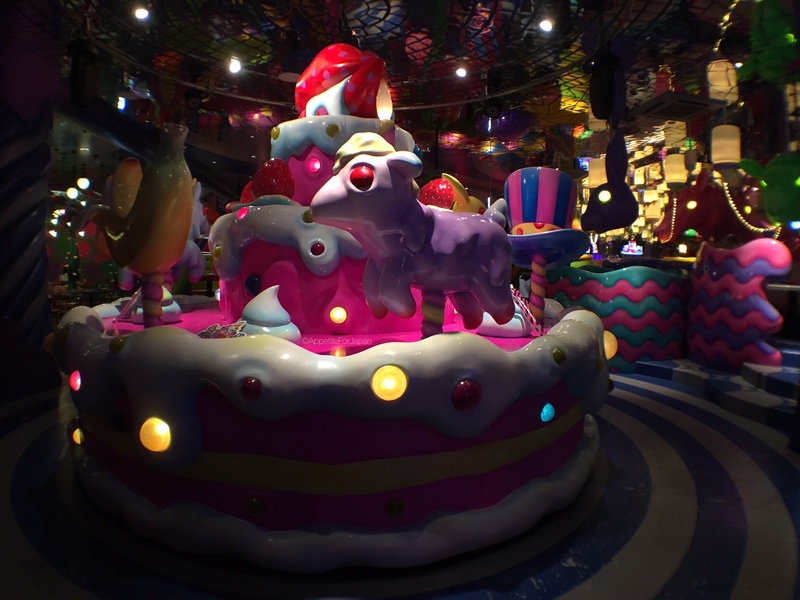 The carousel is called the Sweets-Go-Round. Customers are not allowed to ride it for safety reasons, but are welcome to take photos and pose in front of it. As a general rule, customers are only allowed to take photos within the area that they’re seated, but this wasn’t being enforced when we visited. 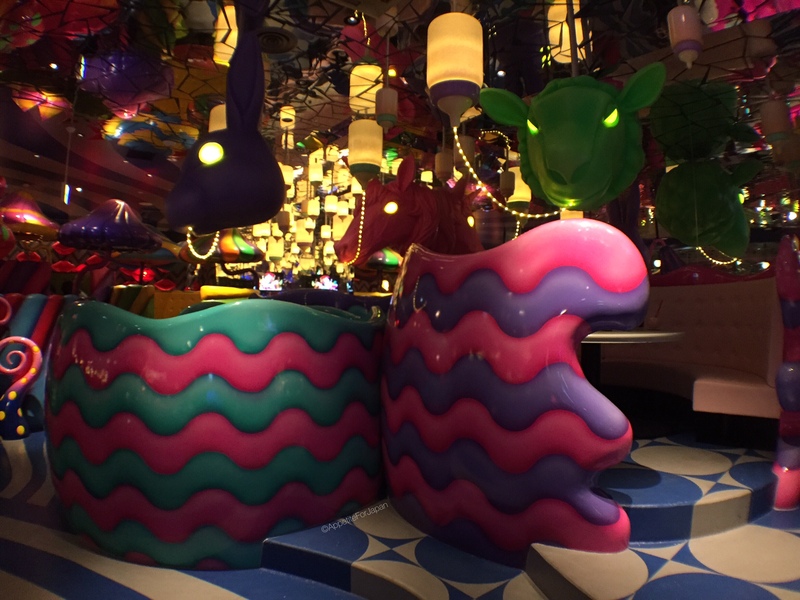 A lot of themed restaurants have very strict rules around taking photos, so it’s great that the Kawaii Monster Cafe is so reasonable in this regard. 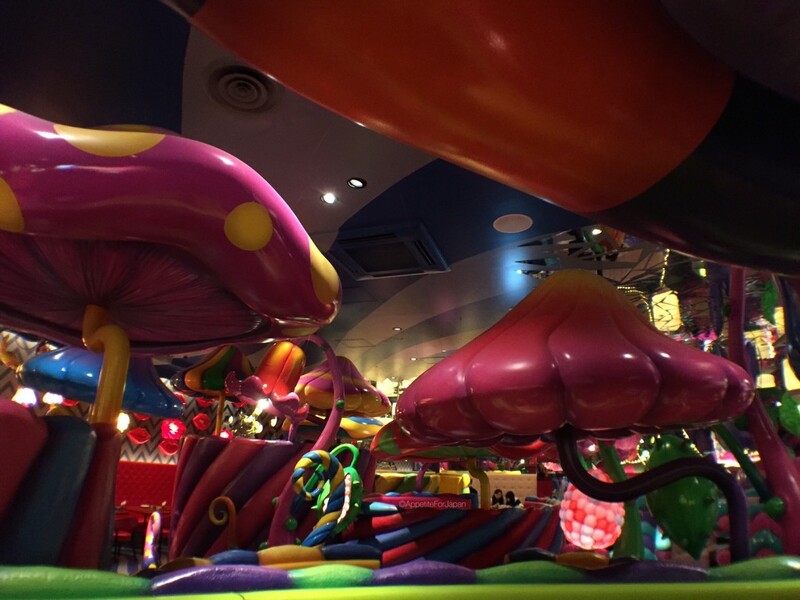 The restaurant is divided into four themed areas: Mushroom Disco, Milk Stand, Bar Experiment and Mel-Tea Room. My favourite area is Mushroom Disco. 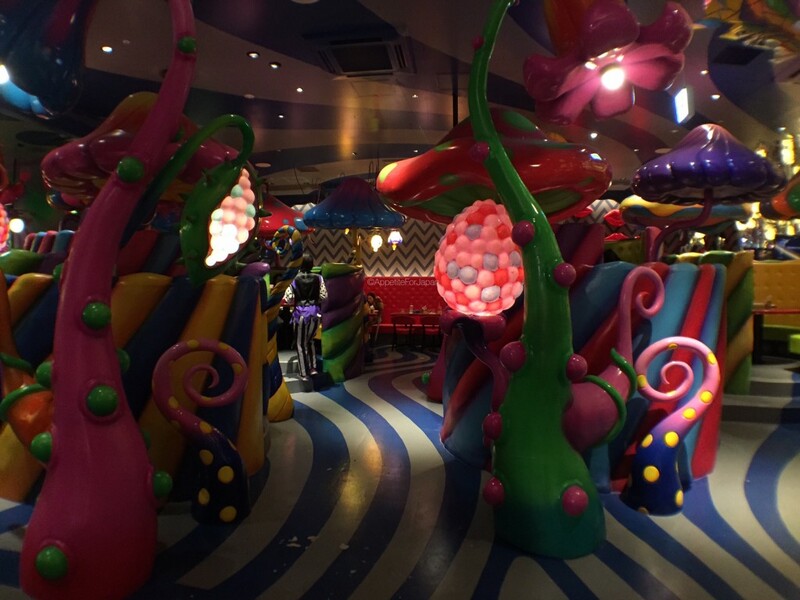 Mushroom Disco is meant to be a forest of giant, colourful, poisonous mushrooms and space plants. We were pretty excited to have scored what I think is probably the best seat in the whole restaurant. 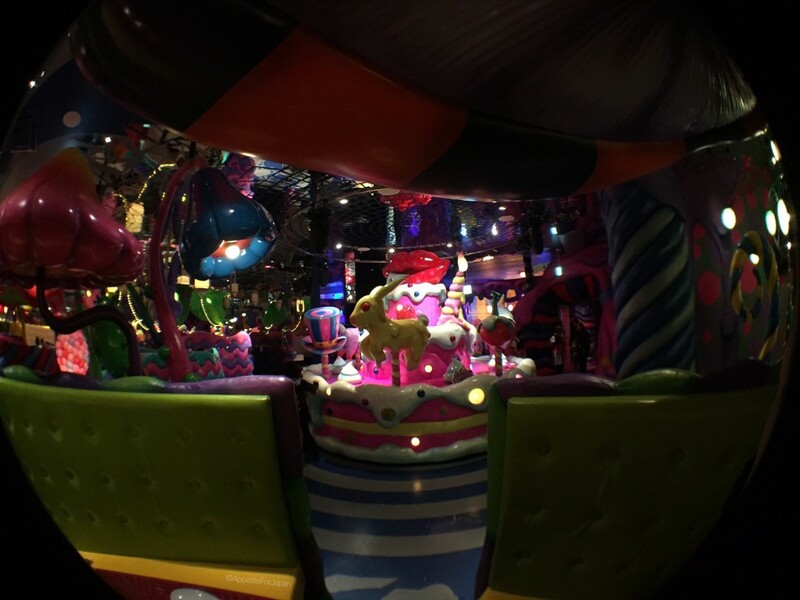 This is one of the front Mushroom Disco booths, looking directly onto the Sweets-Go-Round. 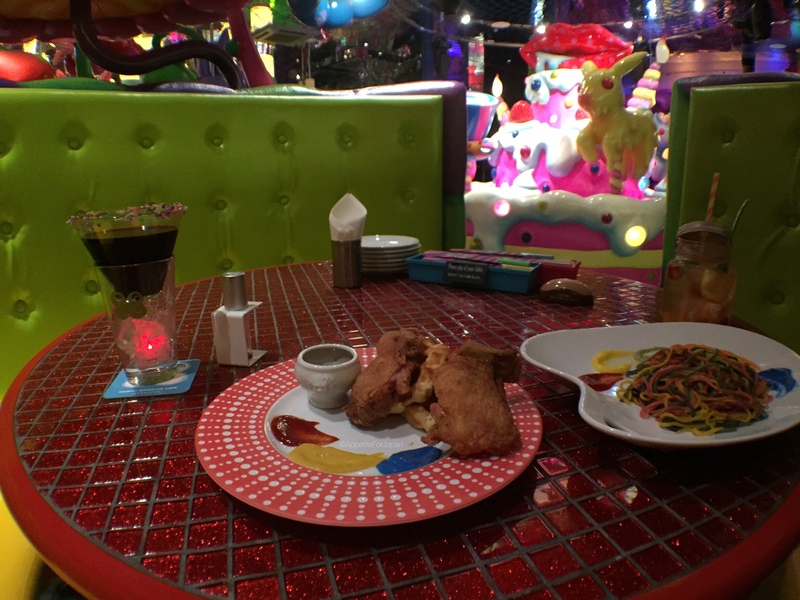 What they didn’t explain to us is that while there is a ‘zone charge’ of 500 Yen per person (a cover charge to simply exist in the restaurant), if you sit at a table that has a capacity of four or six people, you’ll pay the zone charge for that number of people, even if there are only two of you. As a result, rather than paying 1,000 Yen to cover the two of us, we were charged 3,000 Yen because six people could have sat in the booth (and yes, this was while more than half the tables and booths were unused). Above: We may have wasted 3,000 Yen on merely existing in this location, but luckily this went toward the best seats in the house. For those who would prefer to merely pay a cover charge of 500 Yen per person (can you tell that I’m not a fan of cover charges? ), these are the less expensive tables in the Mushroom Disco area. Milk Stand is located next to Mushroom Disco. 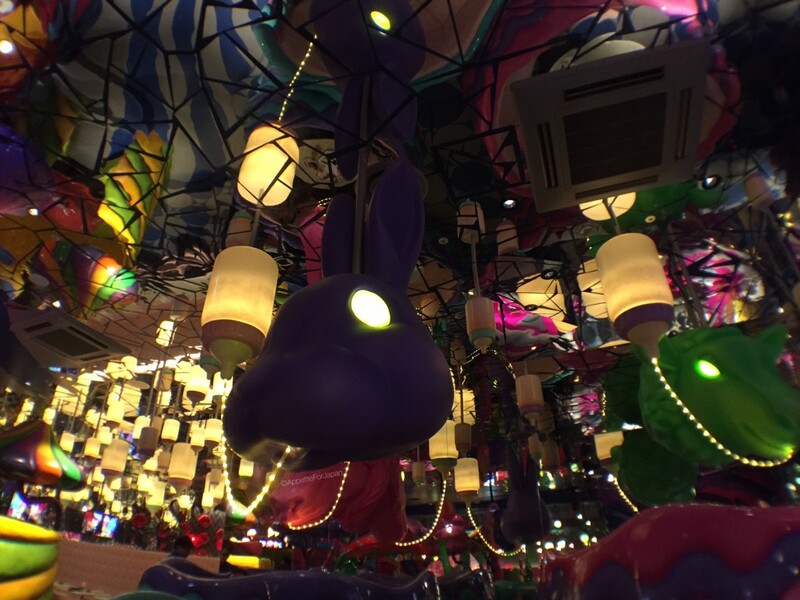 It has similar booth seats, but rather than enormous mushrooms and flowers, this area has giant, colourful heads of rabbits, unicorns and sheep drinking from huge illuminated milk bottles. It’s all about crazy baby animals. The tables behind the booth seats are beneath more of the milk bottle lights. 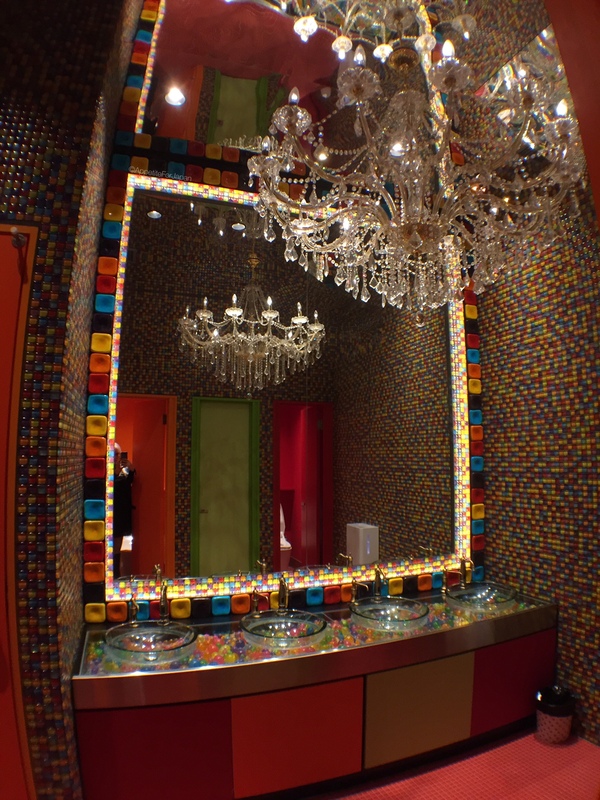 The fractured mirror ceilings add to the trippy effect of the decor. Both Mushroom Disco and Milk Stand can provide good views of the Sweets-Go-Round while you eat, depending on exactly where you’re seated. Some of the booth seats in particular have great views, but others are further back and don’t have such views. 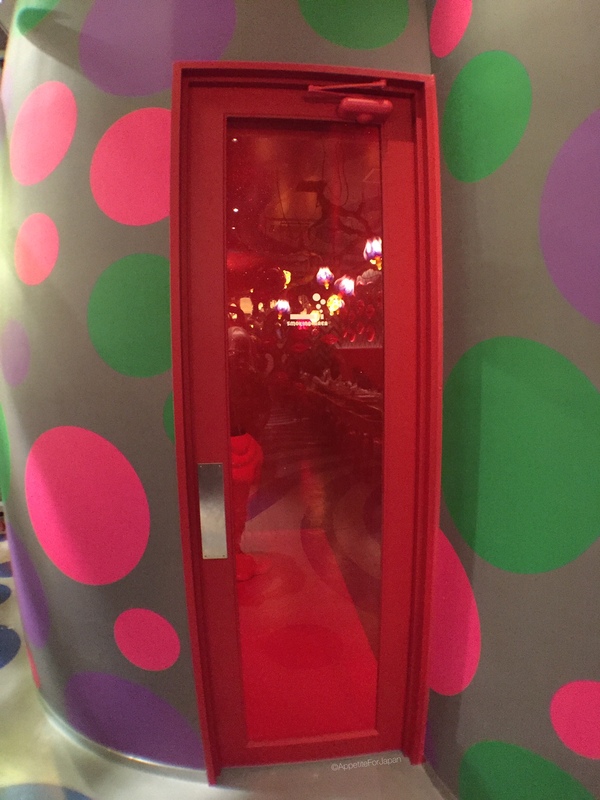 The other two areas – Bar Experiment and the Mel-Tea Room – are located on the other side of the restaurant, past the Sweets-Go-Round and toward the restrooms (which are spectacular enough to warrant a visit too). Bar Experiment is a small area which has bar seats. 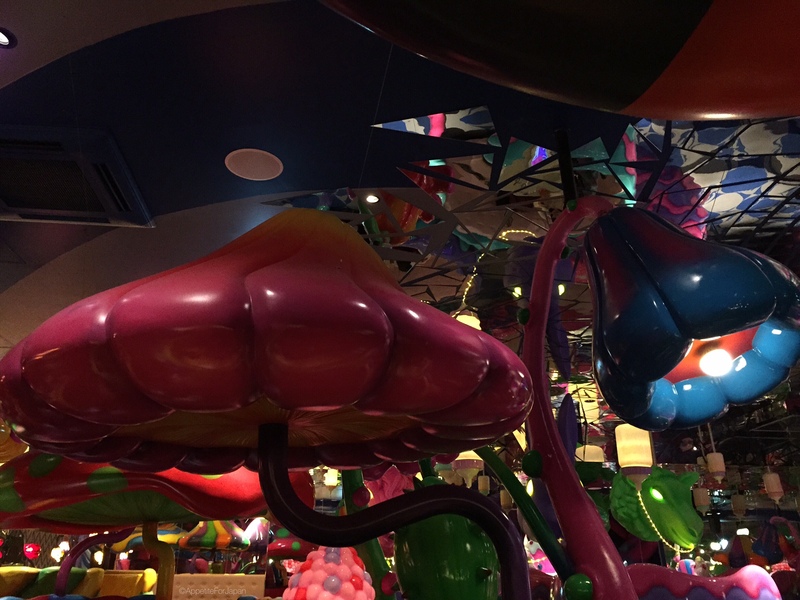 This area was inspired by jellyfish and mysterious, illuminated creatures from the deep sea. The Mel-Tea Room is all about tea parties and is popular with Lolitas. 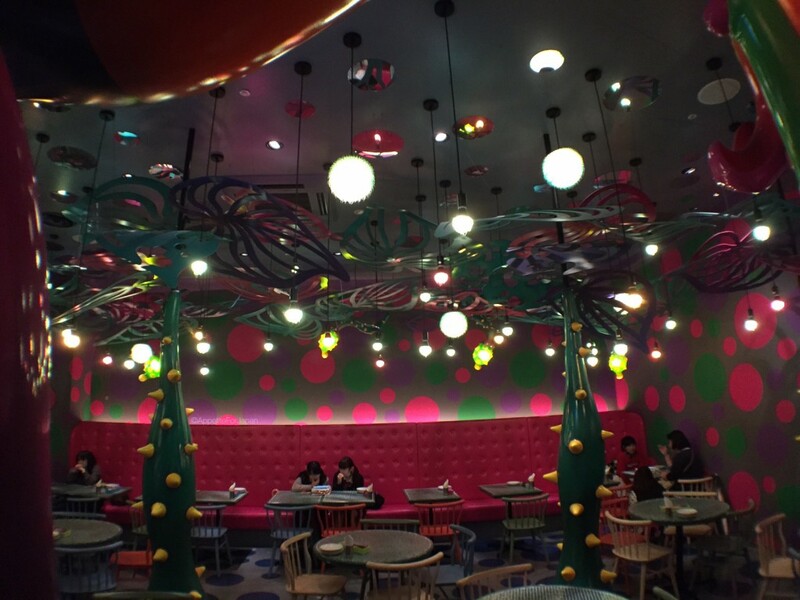 It is decorated with giant macarons on one wall, strawberries and cream with big forks on the other side, and large pastel chandeliers hanging from the ceiling. The Mel-Tea Room booths are giant tea cups. 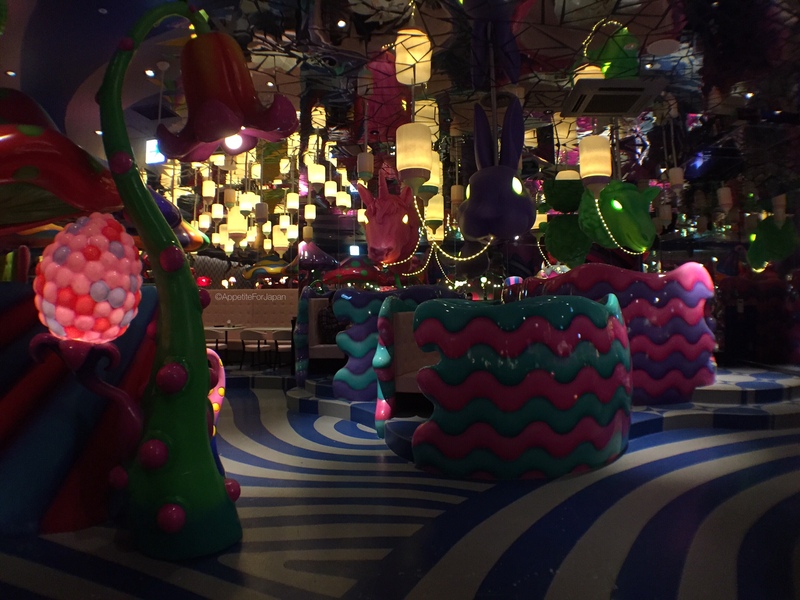 Diamond Dining is also responsible for several famous Alice in Wonderland restaurants, but when it comes to a mad tea party decor, the Mel-Tea Room of the Kawaii Monster Cafe easily takes the cake. Huge chandeliers hang from the ceiling, multi-coloured tiles adorn the walls. 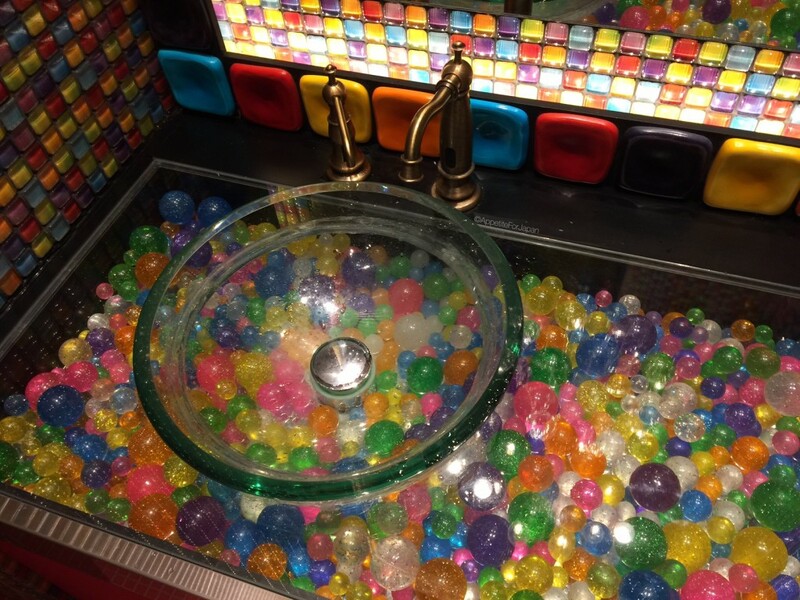 Underneath the translucent basins are multi-coloured, glittery rubber bouncy balls. Harajuku Monster Girls wander around the restaurant, posing for photos with customers. 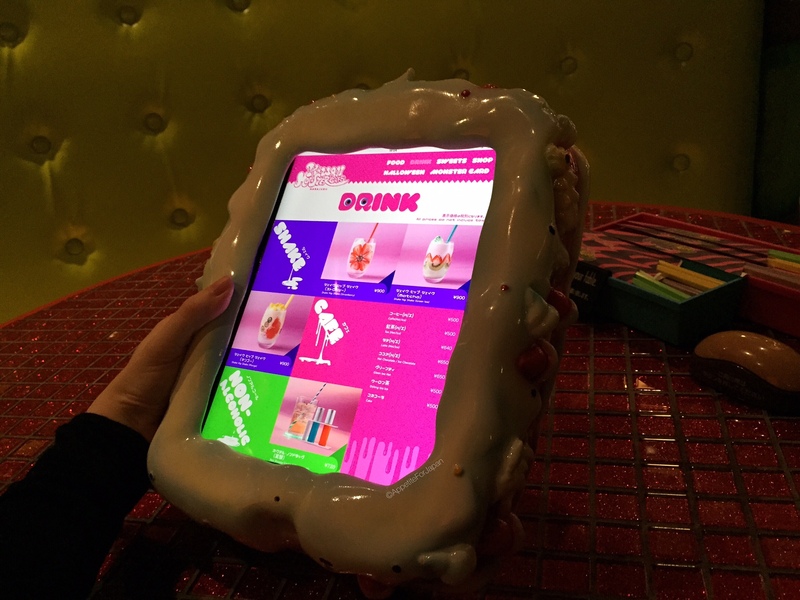 Once seated, a menu is provided in the form of a tablet in a icing-inspired case. 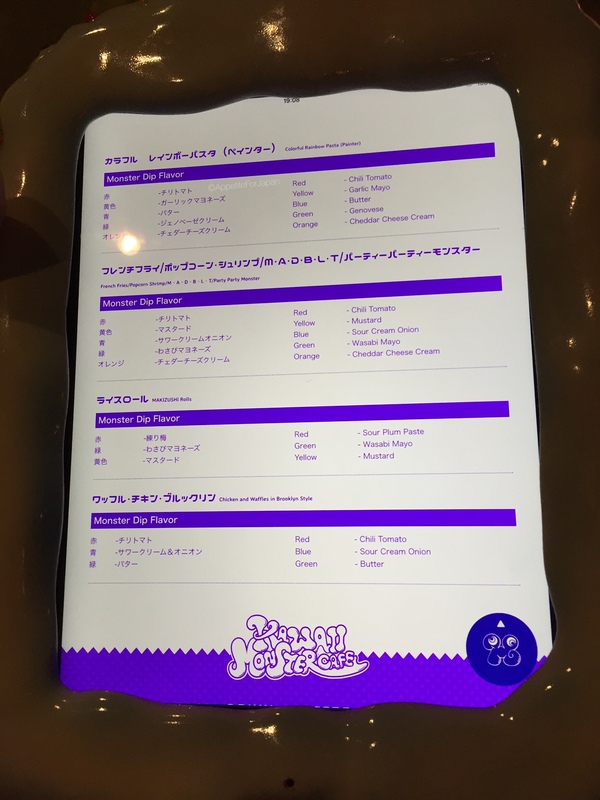 You can’t order from the tablet itself, but you can look at all of the items on the menu (and see the merchandise that you can purchase in the store on your way out). Once you’re ready to order, there’s a button on the table that you can press to call a staff member. 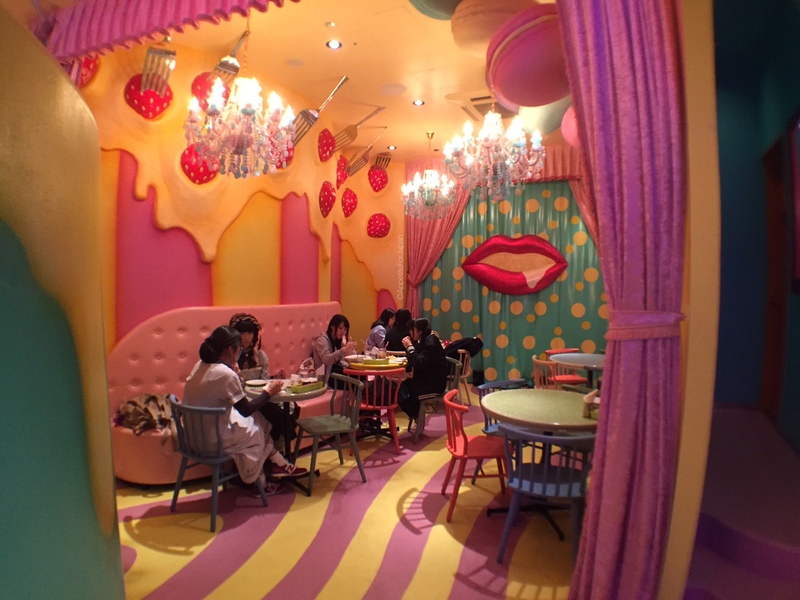 And like Diamond Dining’s other cafes (including the Vampire Cafe, Christon Cafe and the Alice in Wonderland cafes), the Kawaii Monster Cafe is not really a cafe, but a restaurant. As such, you’ll probably want to order mains as well as sweets. The menu itself is not extensive. Some of the menu can be found on the restaurant’s website – they point out that this is only part of the menu, though it is actually almost the whole menu. We ordered two drinks, the first being the alcoholic version of ‘Non Druggy Cocktail (Noctilucent)’. It had rainbow sprinkles around the rim, a light underneath it, and a vile of something alcoholic to add to it. The non-alcoholic one does not come with the little vile. It was very sweet, tasted like cassis and cost 800 Yen. 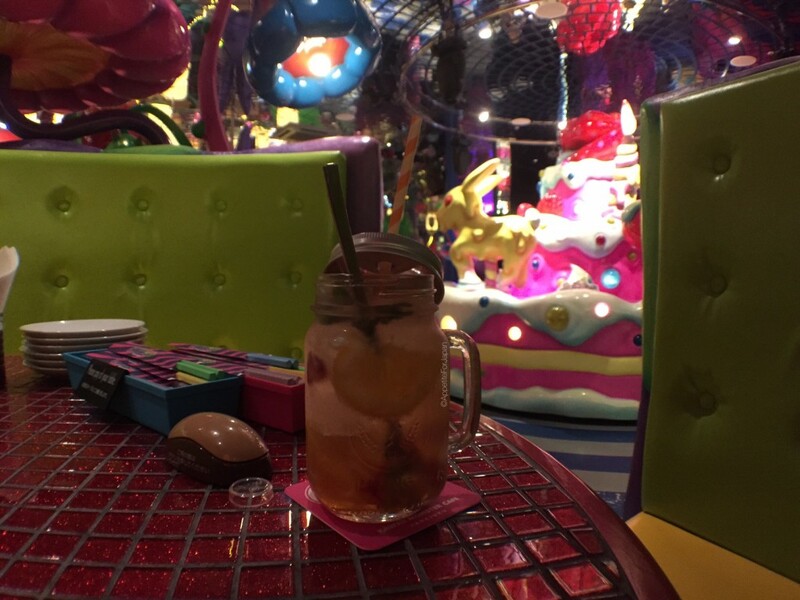 The second drink that we ordered was ‘Fruity Heavenly (Real Fruits)’ – a non-alcoholic punch in a large mason jar. This one cost 780 Yen. 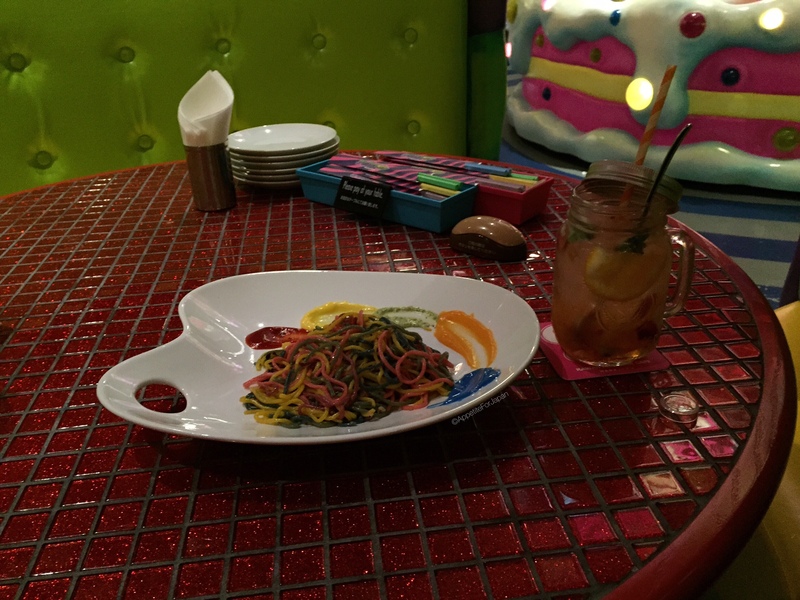 We ordered two mains, the first of which was ‘Colorful Rainbow Pasta (Painter)’ – their most famous dish. This was multi-coloured spaghetti in garlic butter, with five coloured dipping sauces (known as Monster Dip) around the edge. The pasta is not nearly as colourful in real life, and the portions of sauce much skimpier. Still, for a very basic dish that was always going to be a case of style over substance, it certainly wasn’t bad. It cost 1,300 Yen. My partner ordered the ‘Chicken and Waffles in Brooklyn Style’ which comes with three coloured dipping sauces (Monster Dip) and a little pot of maple syrup. I didn’t try it, but he said it was great. 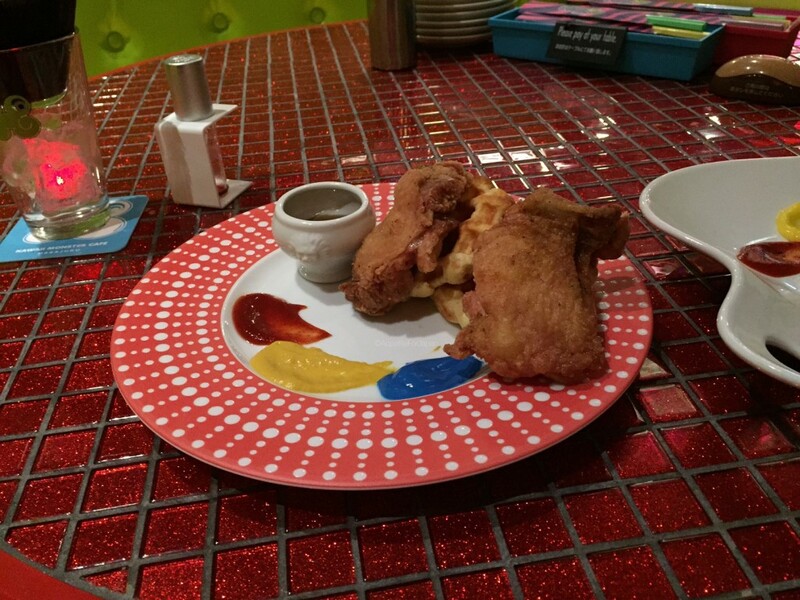 Coming from Australia where chicken and waffles is not common, this is the first time we’d come across this dish. I suspect that this dish will be more familiar to my North American readers. It cost 900 Yen which was quite reasonable. 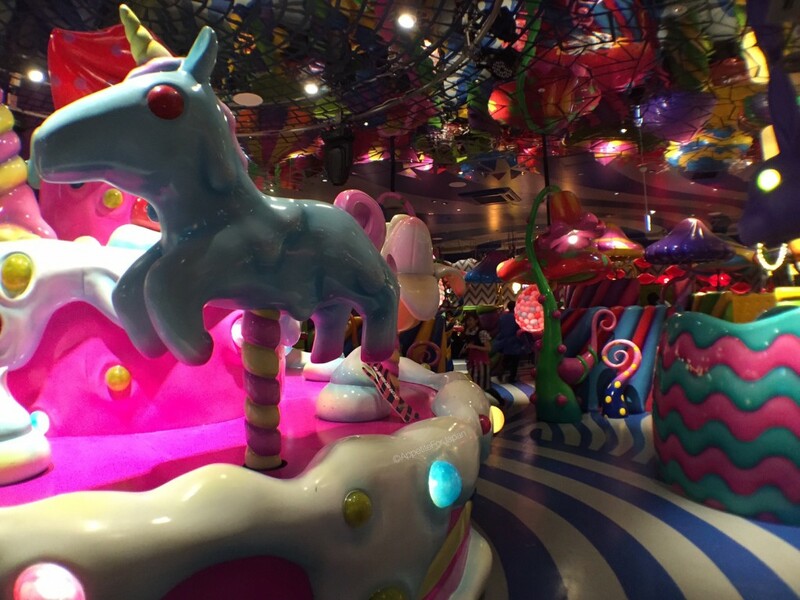 It’s not everyday that you eat lunch with multi-coloured ‘Monster Dip’ sauces in front of a giant, rotating Sweets-Go-Round. The Monster Dip sauce flavors aren’t listed on the website, but they are included in the menu in the restaurant. They differ according to the dish that they’re served with. We only ordered one dessert between the two of us, as we knew it would be plenty to share. 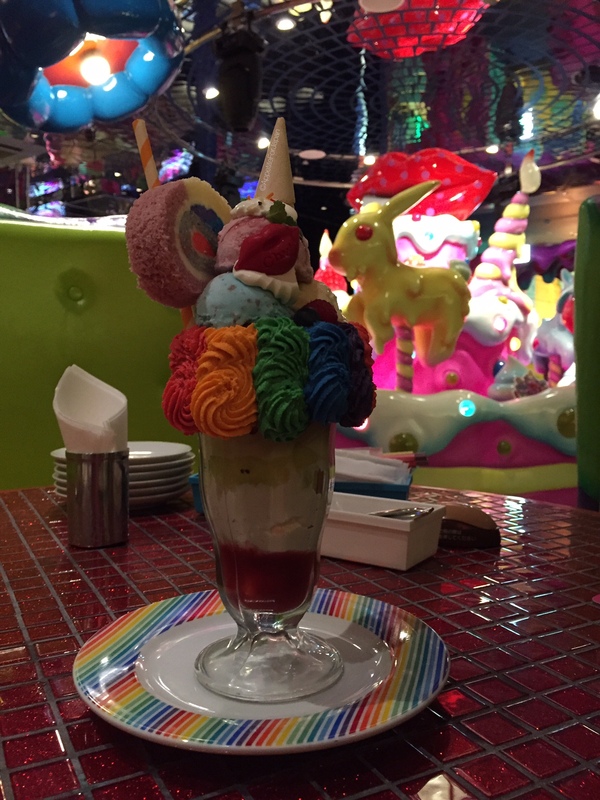 Naturally, we went for the ‘Colorful Poison Parfait (Extream)’. At 2,300 Yen, this is the most expensive parfait we’ve eaten (the second most expensive being Berry Parlour by Cafe Comme Ca), but given that this is really a two-person parfait, it’s not so bad. Although I wouldn’t say that this was the best parfait we’ve ever tried (leave that to the cafes such as Takano that specialise in parfaits), it wasn’t bad (we quite enjoyed it), and it was certainly spectacular. Unlike the rainbow spaghetti, the parfait looked almost the same in real life as it did on the website. We were also pleasantly surprised to find that the rainbow cream around the edge of the Colorful Poison Parfait was flavoured. 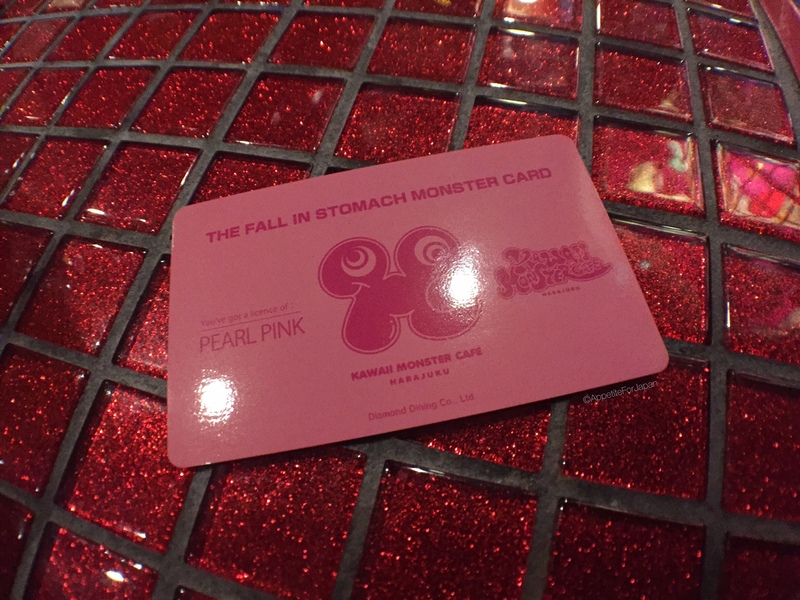 Each customer receives a ‘Fall in Stomach Monster Card’ (a card for falling into Choppy the monster’s stomach). The first level is pearl pink. 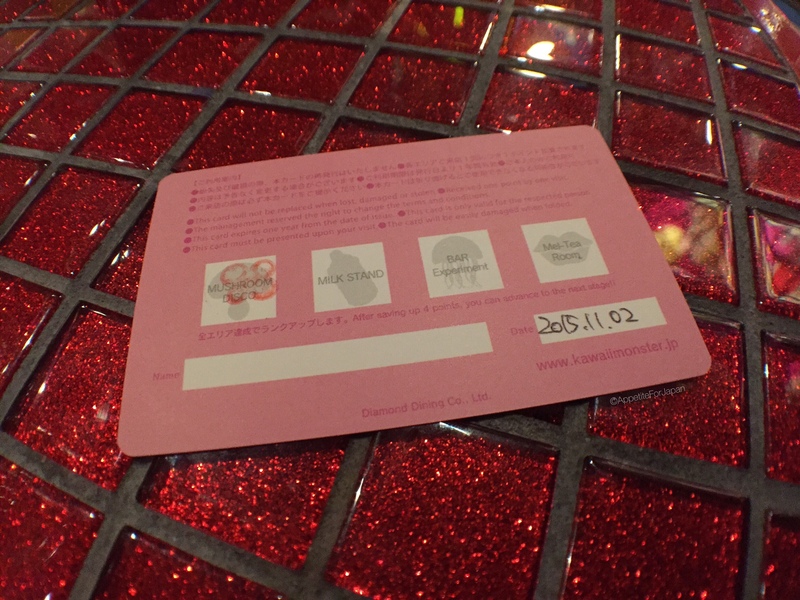 Each time you visit a different area of the restaurant, you get a stamp on your card. Once you’ve visited all four sections, you’ll receive a gift and an upgrade to the next status. More information on the system can be found here. Apparently foreigners are given free chopsticks when they pay and receive their Fall in Stomach Monster Cards. We didn’t receive any chopsticks, so I can’t comment on this. 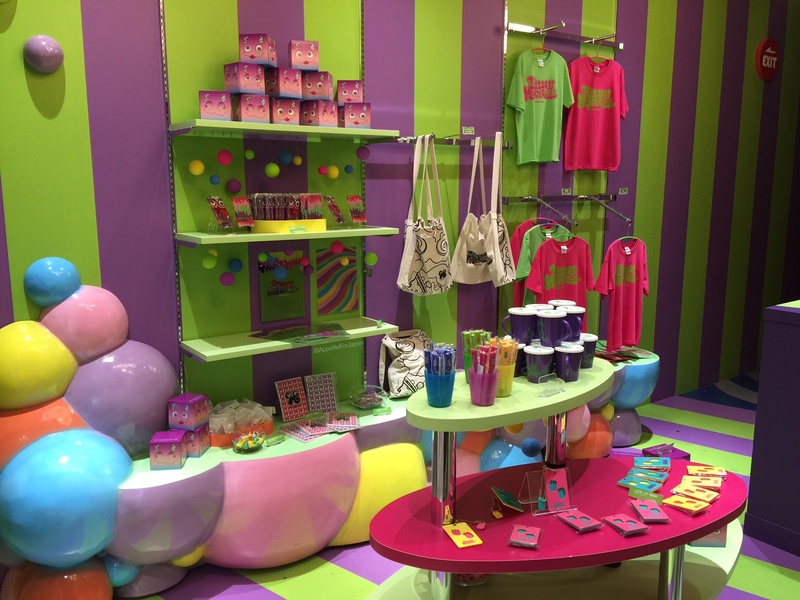 Like many tourist attractions, you exit the Kawaii Monster Cafe via the souvenir shop. 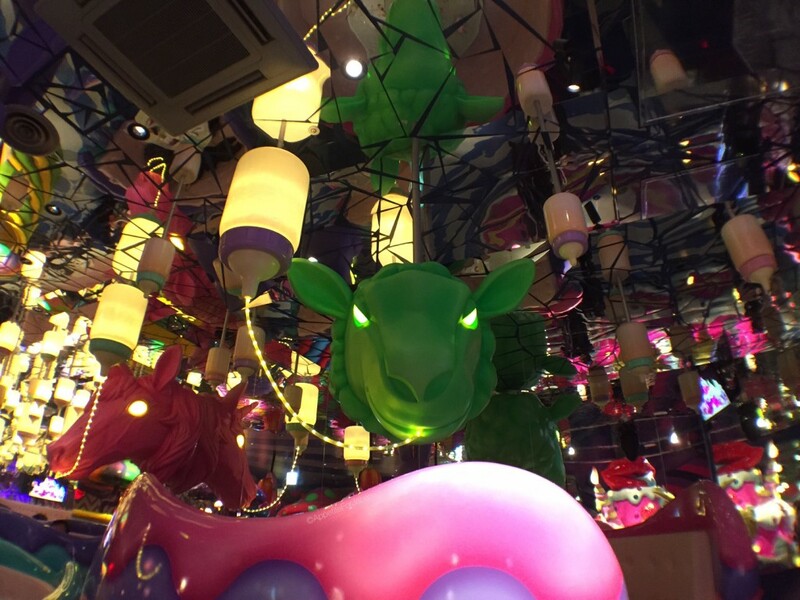 How much does it cost to eat at the Kawaii Monster Cafe? This obviously varies depending on what you order. For the two of us, we had two drinks, two mains and one dessert, which came to 6,080 Yen. Then they added a whopping 3,000 cover charge on top of that, bringing it to a massive 9,080 Yen, and then on top of all of this, of course, is 8% tax. 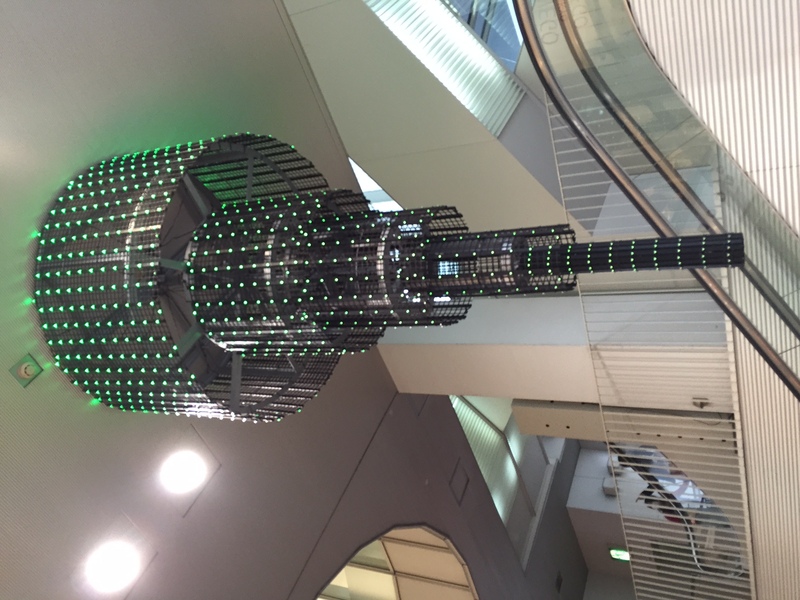 This brought our grand total to 9,800 Yen (which they rounded down every so slightly to an even number). That’s well over AU$100 just for lunch. 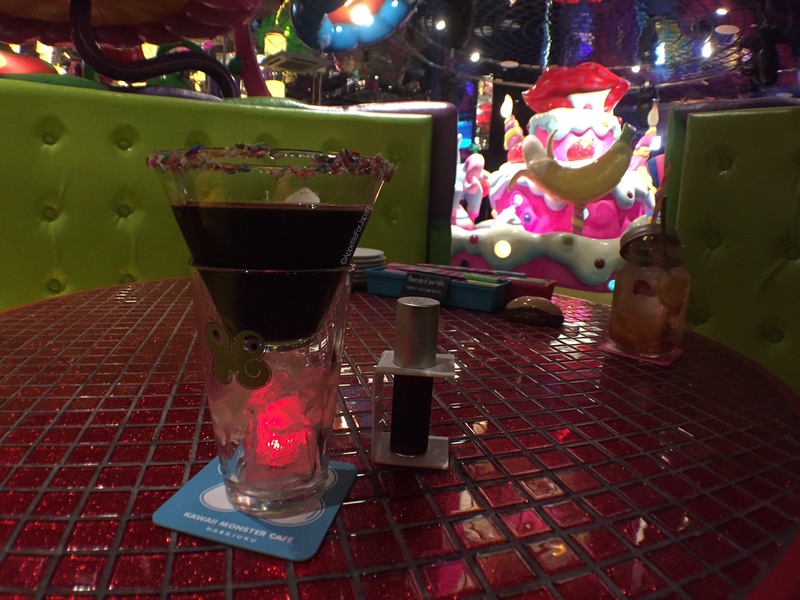 Had it not been for the fact that we inadvertently picked seats that bumped up our total by 2,000 Yen, lunch at the Kawaii Monster Cafe would have cost us 7,646 Yen (that’s still over AU$80 for two drinks, two mains and a shared dessert), which is still very steep. 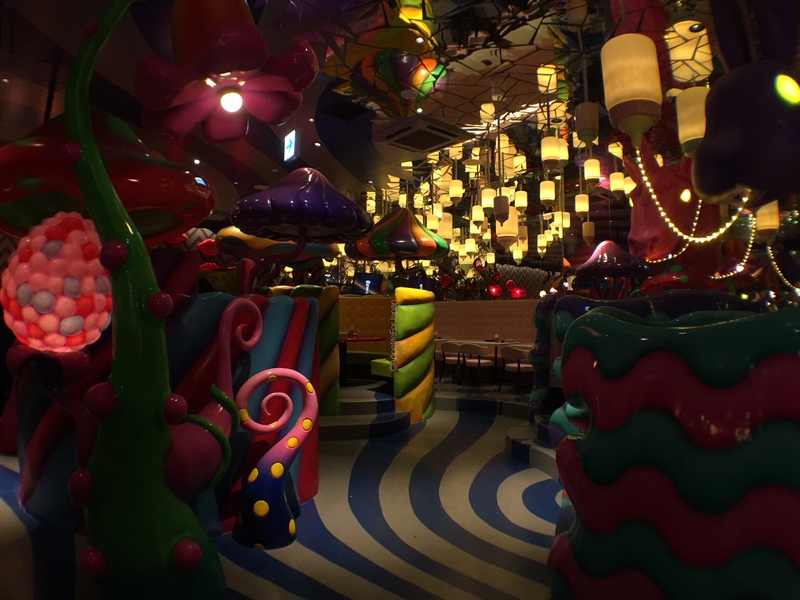 The thing to remember, I suppose, is that you’re not just paying for the food (because the food in itself is definitely not that much), but to dine at what I would say is easily the trippiest restaurant in Tokyo. 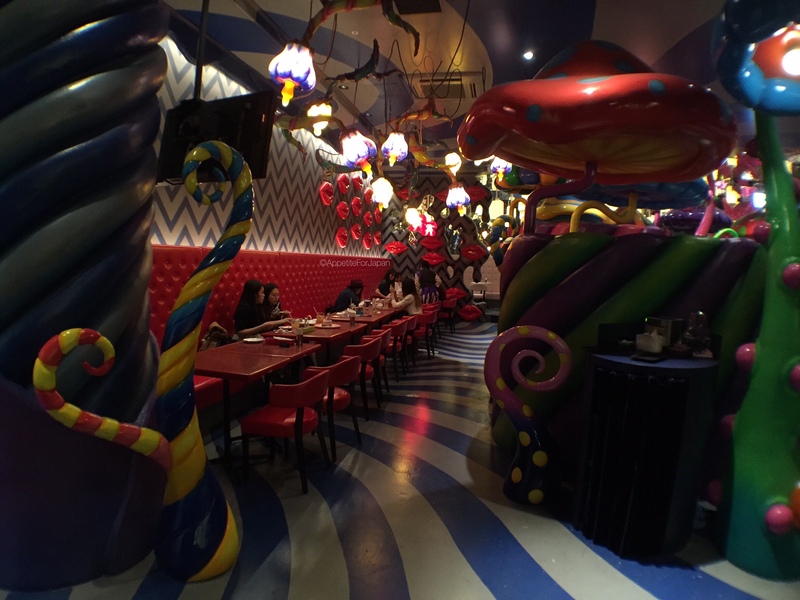 This is the case with most themed restaurants and cafes – they’re rarely inexpensive. 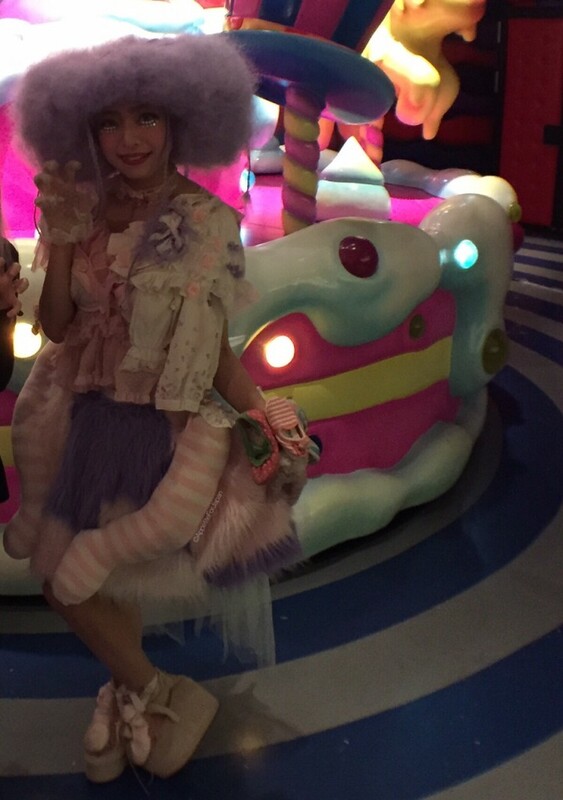 Would I recommend the Kawaii Monster Cafe? 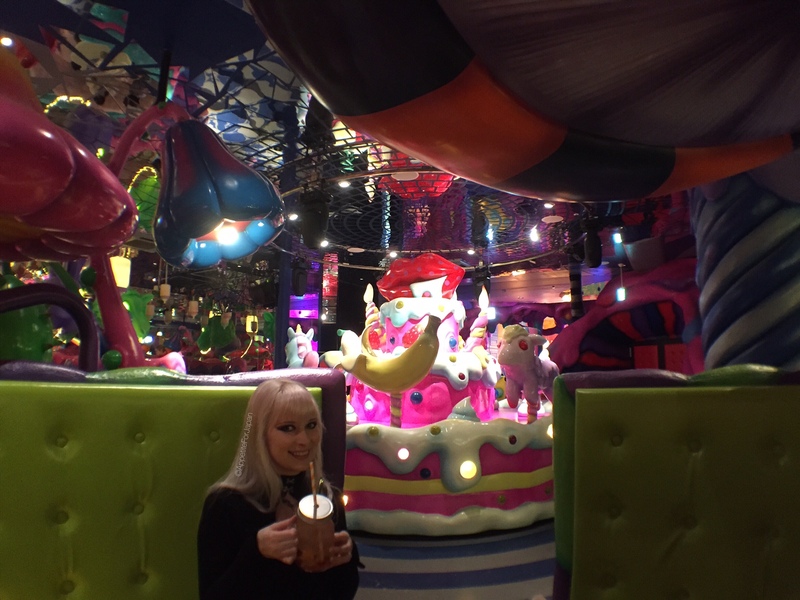 If you’re looking for a crazy, trippy, over-the-top cafe experience, I would definitely recommend the Kawaii Monster Cafe. I can’t see myself going enough times to try all of the different areas given that the menu is limited and it’s not cheap, but if you’re willing to fork out the money, I would recommend checking it out at least once. As for whether to dine in a booth or a regular table, this too comes down to how much you’re willing to spend. 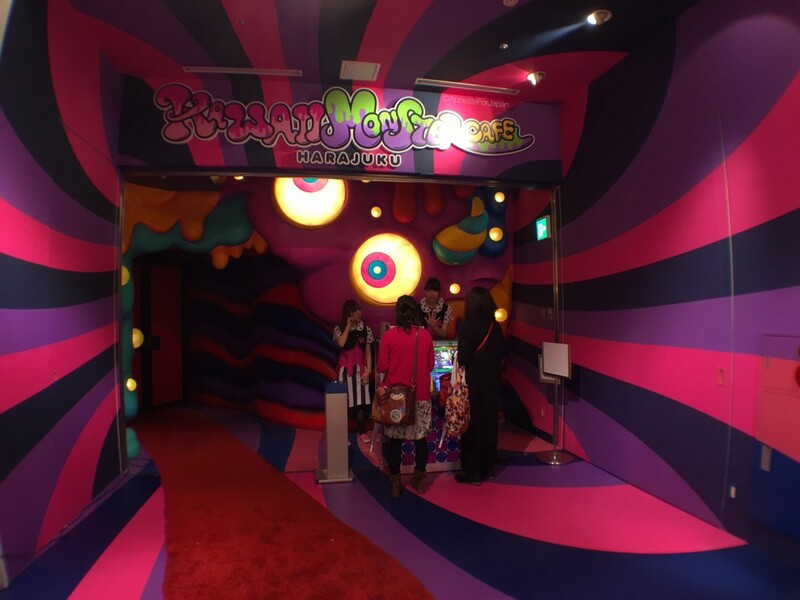 Is the Kawaii Monster Cafe non-smoking? The dining areas of the restaurant are non-smoking. 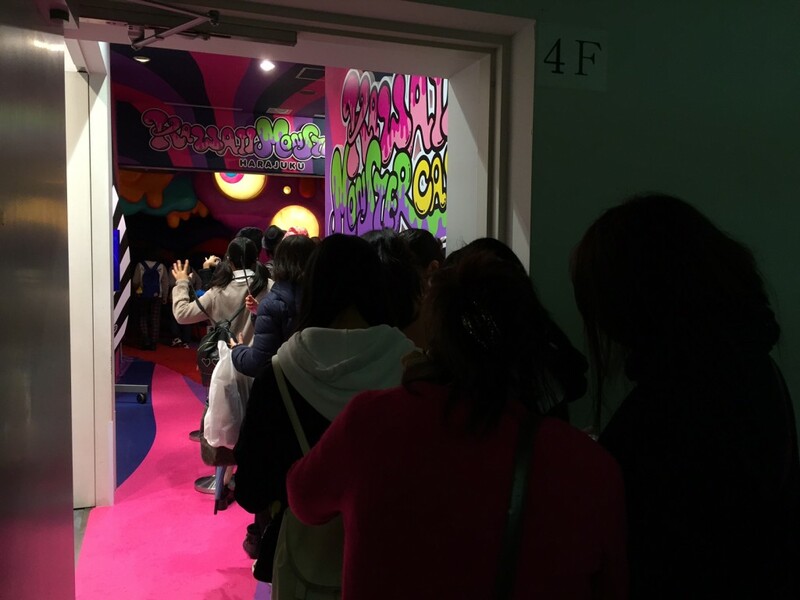 However, there is a smoking room near the exit, which is near the Mushroom Disco section. We didn’t notice any smoke smell in the restaurant at lunchtime when we were there. 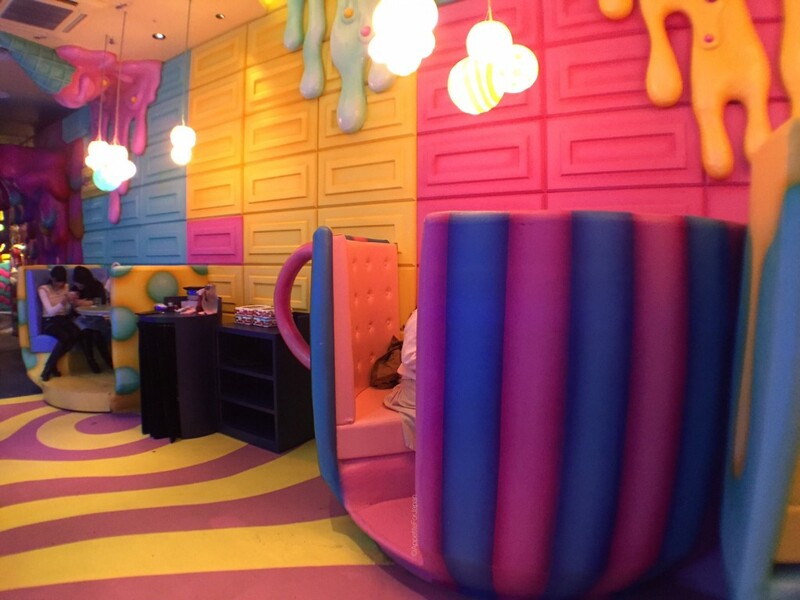 The Kawaii Monster Cafe is fairly easy to find. The simplest way to reach it is to catch the train to Harajuku, come out of the station and cross the road in front of the start of Takeshita-Dori. Walk straight through Takeshita-Dori and as soon as you come out the other side, cross the road again. 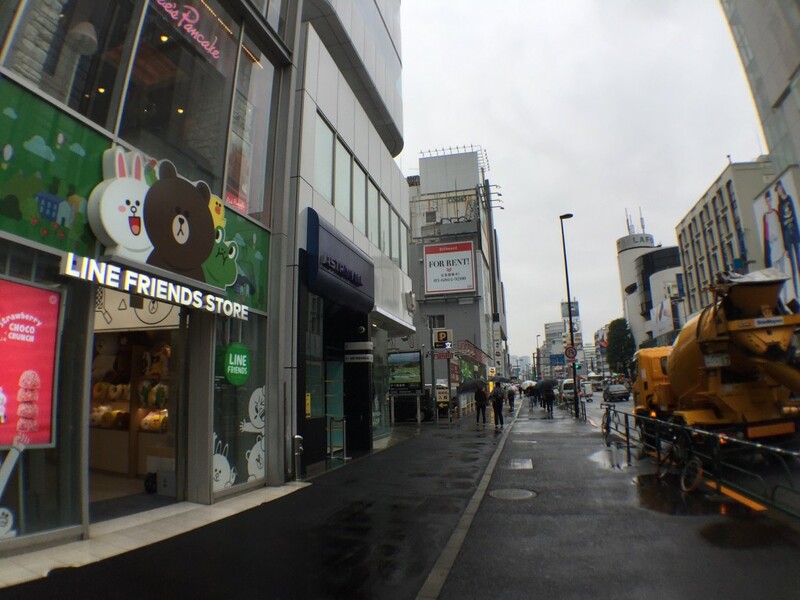 Then turn right and walk down the street past the Line Friends Store on your left (you’ll see the large Guzman and Gomez restaurant on the other side of the road). 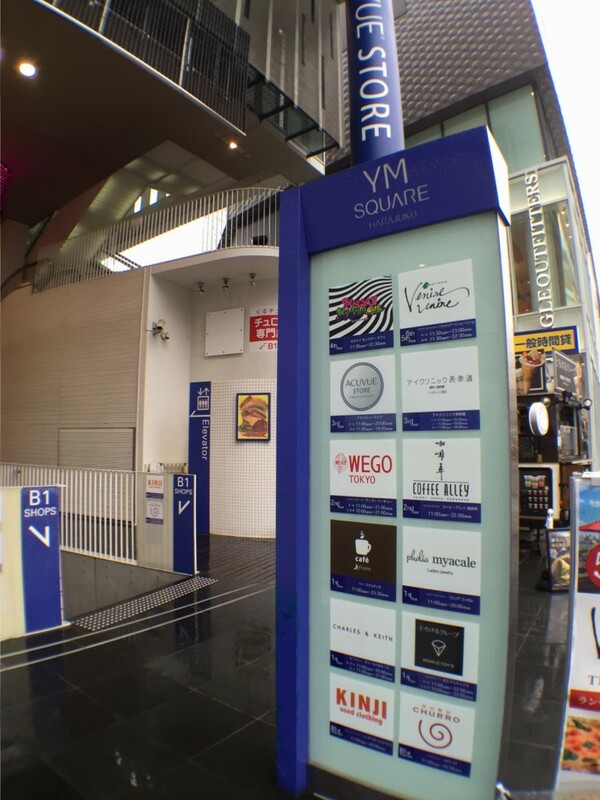 Keep walking until you reach the YM Square building. 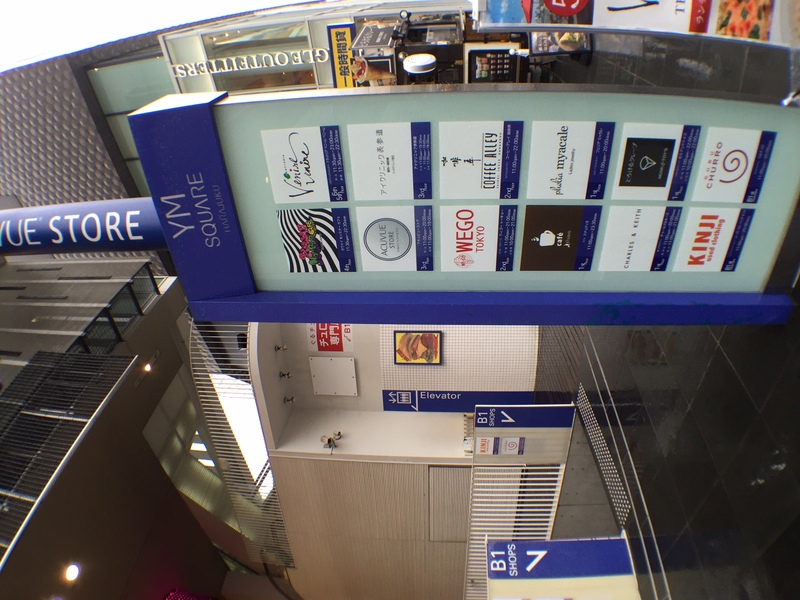 There’s a sign right by the footpath which lists the stores that are in the building (the Kawaii Monster Cafe is the one in the top left corner with the black and white stripes and pink/green/yellow writing). Take the escalators up to the fourth floor. 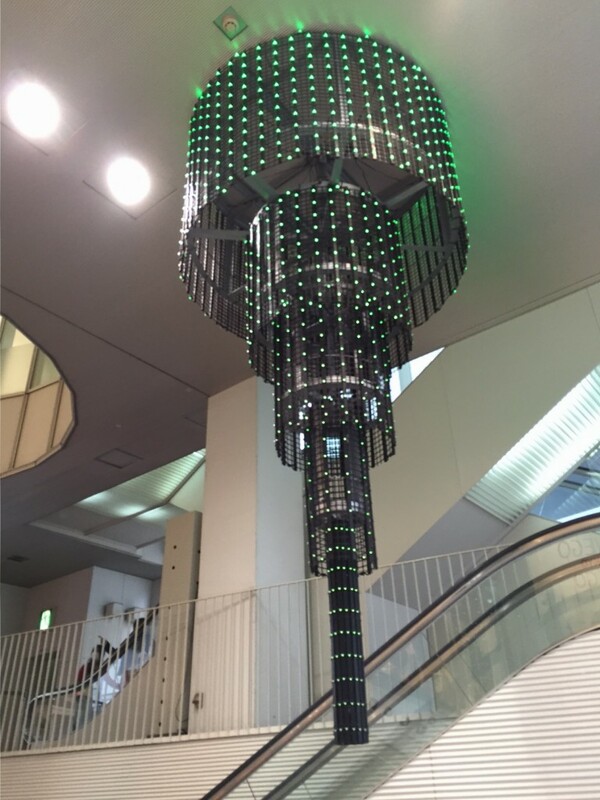 If you can see the below light which changes colours, you’re in the right building. Once you’re up there, find the end of the queue and line up. There is also a map on the restaurant’s website. 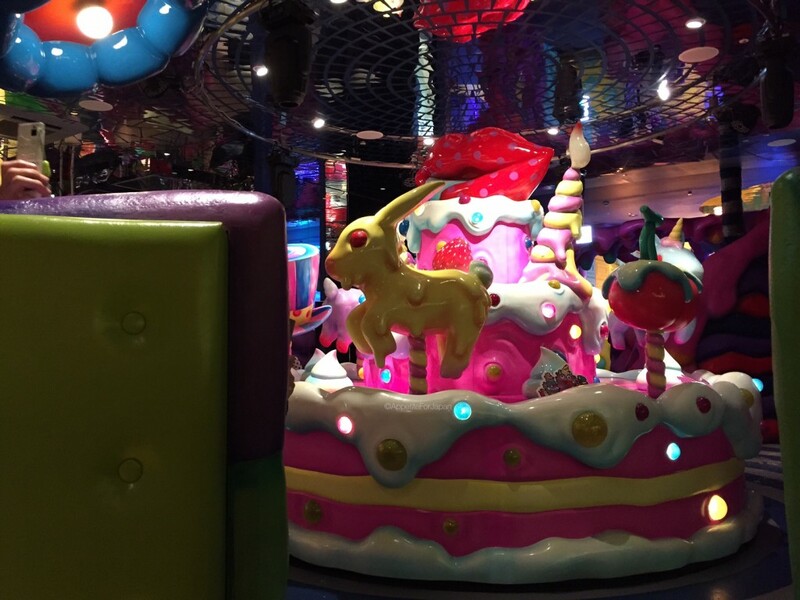 I’m going to end this post by making a very big call: having visited most of the theme cafes and restaurants in Tokyo (yes, there are more posts on these to come), I would say that the Kawaii Monster Cafe in Harajuku is the best theme restaurant that I have visited. 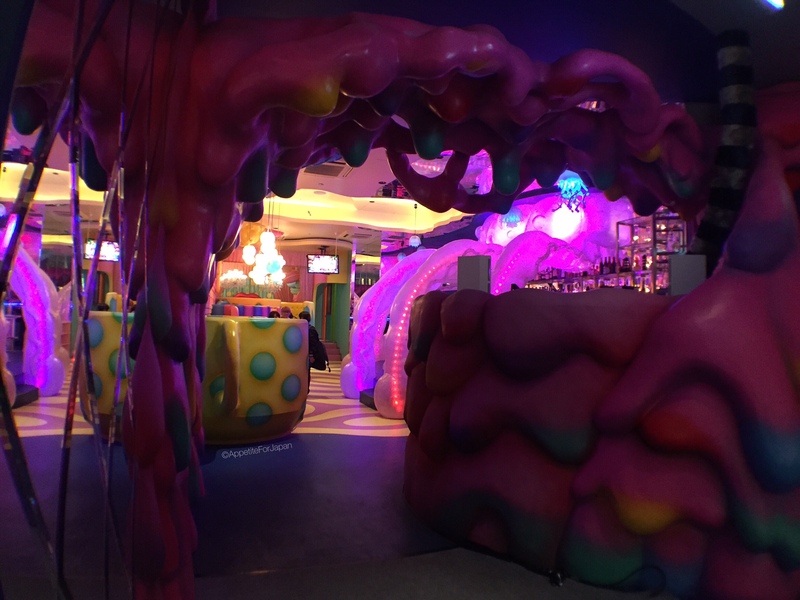 Despite the cover charge, the overall costs and anything else that I think could be improved upon, when it comes to committing to a theme, I think the Kawaii Monster Cafe has set a new standard. The decor is incredible, and the menu – whilst small – has some imaginative items. 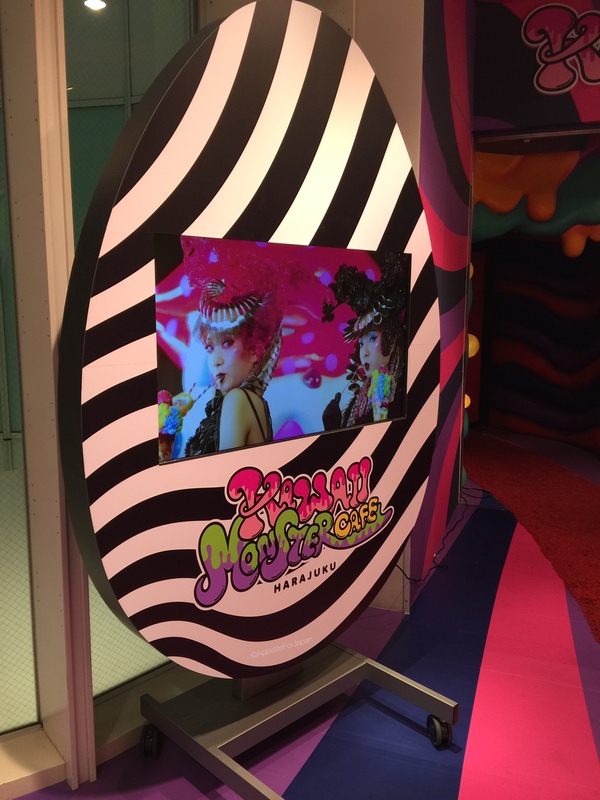 The Monster Girls in costume are great, allowing customers to take photos is another plus, the crazy looking bathrooms demonstrate the level of thought that must have gone into designing the place, and of course the Sweets-Go-Round is the icing on the cake.